1. Preheat the oven to 350 degrees F. Grease a casserole with cooking spray and set aside. 2. In a saucepan, add in the ground beef and cook until done. Drain the excess fat and set aside. 3. Into the same pan, add in the green bell pepper, purple onion and sweet onion. Sauté for few minutes. 5. In the prepared casserole dish place 3 taco shells on bottom and spread ½ of refried beans with a spatula, press down the shells while spreading beans. Top with half of beef mixture and 1 cup of cheese blend. Spread all the ingredients evenly. 6. Place 4 taco shells in opposite direction, layer with refried beans and spread with spatula. Top with remaining beef and cheese blend, reserving 1 tbsp. for final layer. 7. Top the lasagna with remaining taco shells and taco sauce. Sprinkle remaining cheese blend and bake for 20 – 25 minutes. 8. 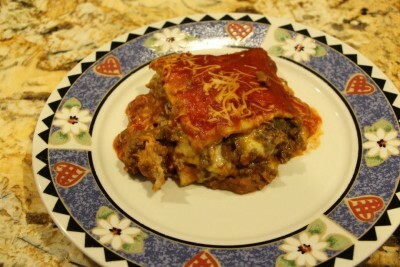 Serve Mexican Lasagna with salad.